Undoubtedly Machu Picchu is one of the main tourist destinations in the world, it is considered one of the seven wonders of the world and one of the most amazing places on the planet; but if you’re not convinced by the idea of arriving at Machu Picchu after a 4-day hike, your best alternative is to board the train to Machu Picchu. 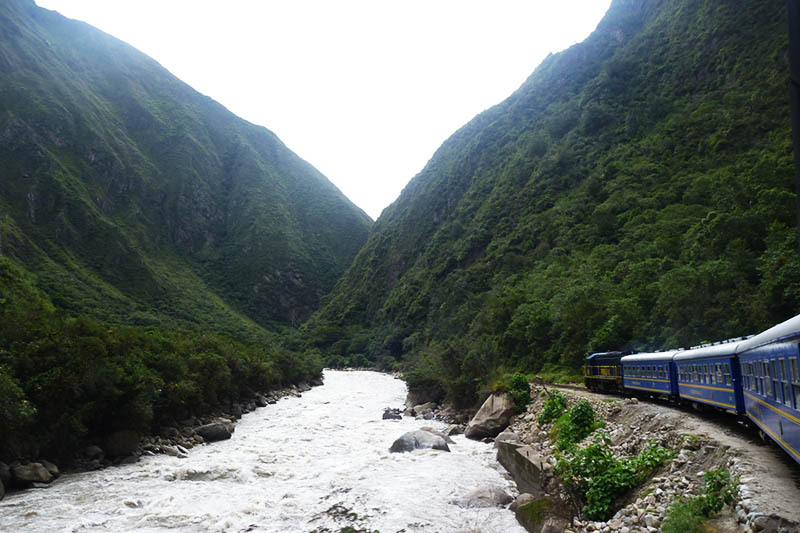 Arriving to Machu Picchu by train is the best alternative to the Inca Trail. We can offer packages to Machu Picchu by train for 1 or 2 days, it is the fastest way to get to Machu Picchu and the best alternative to travel the Inca road of 4 days in 2018; In addition to the visit to Machu Picchu you can hire other tours in Cusco, considered the best destination in South America. You will have to get to Machu Picchu by train, if you did not manage to reserve the permits for the Inca Trail or if you want a calmer and quicker way to arrive. This – short – alternative to the Inca Trail 4 days in 2018 will take you by train through the Sacred Valley of the Incas, on a 1 day trip to the Inca city of Machu Picchu. The route is considered one of the most amazing short train routes that exist. It will take you through the sacred valley of the Incas, with incredible views of mountains of the Andes Mountains to the cloud forest where Machu Picchu is built. As you get closer to Machu Picchu, you will feel the incredible energy that can be felt in this valley and in the city that was sacred to the Incas. The adventure begins in the city of Cusco. The day of your visit starts very early, boarding the first buses to Ollantaytambo, where you will board your train to Machu Picchu. In case you want to book Machu Picchu tickets that include the mountains we recommend you book the Machu Picchu tour of 2 days, or the Machu Picchu 3-day tour, well in advance. If you have more than one day available or if you booked Machu Picchu tickets that include the Machu Picchu mountains, we must recommend the trip to Machu Picchu by train for 2 days and 1 night. This alternative to the Inca Trail 4 days begins in the city of Cusco, towards the station of Ollantaytambo and then by train to Aguas Calientes; you will have the afternoon free to enjoy the thermal waters of the town and rest comfortably, before making your visit to Machu Picchu the next day. Choosing this option will allow you to be very early in Machu Picchu, so you can book tickets Machu Picchu that include the mountains to enter the first groups, from 7 am. Machu Picchu or Huayna Picchu, you choose. Make the trip to Machu Picchu 2 days will allow you to make your visit without haste and with enough time to enjoy everything around Machu Picchu. The first day starts very early, with a bus trip to the town of Ollantaytambo – do not miss the archaeological site – once in Ollantaytambo you will board the train heading to Aguas Calientes, very close to Machu Picchu you will spend the night in this place before of the day of your visit to Machu Picchu. The next day, very early, will begin the ascent to the entrance gate to Machu Picchu. After enjoying the Inca city of Machu Picchu and amazing buildings such as the Temple of the Sun, the Temple of the Condor or the Intihuatana, you will descend again to Aguas Calientes, to board the return train to Ollantaytambo and then the bus to Cusco. Taking the Machu Picchu and Cusco 3 days tour will allow you to be early enough to be able to book the Machu Picchu tickets that include the mountains in the first groups (at 7 am). The last day will tour the main attractions of the city of Cusco in a half day City Tour that will leave you enough time to explore on your own. It is one of the best experiences you can have in life and is considered one of the best hikes on the planet. If you have the time available (4 days), know that the Inca Trail is the most amazing way to enter Machu Picchu. It starts at kilometer 88 of the train tracks to Machu Picchu. It will travel 44 kilometers to the Puerta del Sol (intipunku), the old main gate to the Inca city of Machu Picchu, where people entered the sacred city 500 years ago. To obtain the permits to the Inca Trail to Machu Picchu for the desired date, it is necessary to reserve them many months before; We recommend you book your spaces 8 months in advance, and more if you plan to have your view between the months of May and August (high season). In addition to incredible scenery and stunning Incas and pre-Inca constructions, the Inca Trail is full of lush flora and fauna, hundreds of bird species, hundreds of butterfly species, hundreds of orchid species and some animals and plants that you will not see anywhere else in the world.